Poor old innocent Castle Wolfenstein is going to be covered in bits of Nazis again when B.J. Blazkowicz returns (er, in the past, as this is a prequel) to paint its walls and ceilings through the medium of guns. Wolfy standalone The Old Blood was announced the other day, and now publishers Bethesda have shown some footage off in a PAX East livestream. Captured by Eurogamer (thanks, Eurogamer! 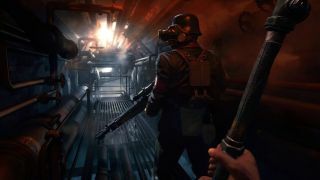 ), the footage shows Blazkowicz re-infiltrating the famous castle as he tries to "steal the coordinates to General Deathshead’s compound". Good Lord why would he want to go in there? Oh, to stop an "obsessed Nazi archaeologist [from] exhuming mysterious artefacts that threaten to unleash a dark and ancient power". It's almost certainly worth doing it, then. The above footage shows a bit set in a crypt, a bit where our hero scales a wall with his trusty new pipe, a bit where he shoots baddies from a cable car, and lots of other bits that don't seem too dissimilar from The New Order. Still: more nu-Wolfenstein is almost certainly a good thing, if it's as up-to-snuff as Philip Savage says it is.